Gavrilo Princip (Serbian Cyrillic: Гаврило Принцип, pronounced [ɡǎʋrilo prǐntsip]; 25 July 1894(1894-07-25) - 28 April 1918(1918-04-28)) was a Bosnian Serb who was a Yugoslav nationalist associated with the movement Mlada Bosna (Young Bosnia). 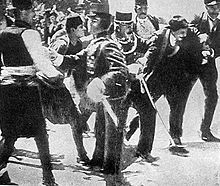 Princip assassinated Archduke Franz Ferdinand of Austria and his wife, Sophie, Duchess of Hohenberg, in Sarajevo on 28 June 1914, succeeding where one of his co-conspirators had just failed. Princip and his accomplices were arrested and implicated a number of members of the Serbian military, leading Austria-Hungary to issue a d�marche to Serbia known as the July Ultimatum. This set off a chain of events that led to World War I.
Gavrilo Princip was born in the village of Obljaj, a poor area of Bosnia near Bosansko Grahovo, Bosnia and Herzegovina, Austria-Hungarian Empire, the son of a postman. His parents, Petar and Marija (n�e Mićić), had nine children, five sons and four daughters, six of whom died in infancy. His impoverished parents could not provide for him and sent him to live with an older brother in Zagreb. Most historians agree that Princip was a member of the group known as "Union or Death", a smaller, breakaway group of Young Bosnia. The Young government movement was a group made up of Serbs, Croats, and Bosniaks, committed to the independence of the South Slavic peoples from Austria-Hungary. 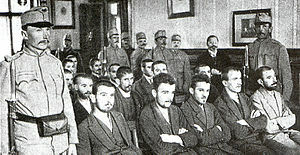 In February 1912, Princip took part in protest demonstrations against the Sarajevo authorities for which he was expelled from school. Following his expulsion, he moved to Belgrade. In Belgrade, he sought to gain admission to the First Belgrade Gymnasium but failed the entrance exam. On 6 October 1908, Bosnia-Herzegovina had been declared a part of the Austro-Hungarian Empire by Emperor Franz Joseph. This created a stir among Slavic people of southern Europe and the Russian Tsar who opposed this annexation. In 1912, Serbia was abuzz with mobilization for the First Balkan War. Princip planned to join the komite, irregular Serbian guerrilla forces committee of the secret society Unification or Death (Ujedinjenje ili Smrt), known as Black Hand. Princip, however, was rejected by the komite in Belgrade because of his small physical stature. He then went to Prokuplje in Southern Serbia where he sought a personal interview with Tankosić. Tankosić, however, rejected Princip as being "too small and too weak". Vladimir Dedijer argued that this rejection was "one of the primary personal motives which pushed him to do something exceptionally brave in order to prove to others that he was their equal". Picture - A map depicting the assassination route. On 28 June 1914, Gavrilo Princip participated in the assassination in Sarajevo of the Austrian Archduke. General Oskar Potiorek, Governor of the Austrian provinces of Bosnia and Herzegovina had invited Franz Ferdinand and Countess Sophie to the opening of a hospital. The Archduke knew that the visit would be dangerous, knowing his uncle, Emperor Franz Josef, had been the subject of an assassination attempt by the Black Hand in 1911. Just before 10 a.m. on Sunday, the royal couple arrived in Sarajevo by train. In the front car was Fehim Čurčić, the Mayor of Sarajevo and Dr. Gerde, the city's Commissioner of Police. Franz Ferdinand and Sophie were in the second car with Oskar Potiorek and Count Friedrich August von Harrach-Rohrau. The car's top was rolled back in order to allow the crowds a good view of its occupants. The six conspirators lined the route. They were spaced out along the Appel Quay, each one with instructions to try to kill Franz Ferdinand when the royal car reached his position. The first conspirator on the route to see the royal car was Bosniak Muhamed Mehmedba�ić. Standing by the Austro-Hungarian Bank, Mehmedba�ić lost his nerve and allowed the car to pass without taking action. Mehmedba�ić later said that a policeman was standing behind him and feared he would be arrested before he had a chance to throw his bomb. At 10:15 a.m., when the six car procession passed the central police station, nineteen-year-old student Nedeljko Čabrinović hurled a hand grenade at the Archduke's car. The driver accelerated when he saw the object flying towards him, but the bomb had a 10 second delay and exploded under the wheel of the third car. 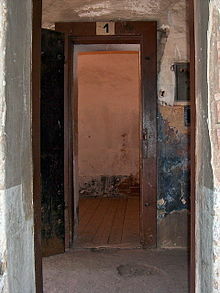 Two of the occupants, Eric von Merizzi and Count Ludwig Joseph von Boos-Waldeck were seriously wounded. About a dozen spectators were also hit by bomb shrapnel. After Čabrinović's bomb missed the Archduke's car, five other conspirators, including Princip, lost an opportunity to attack because of the heavy crowds and the high speed of the Archduke's car. To avoid capture, Čabrinović swallowed cyanide and jumped into the River Miljacka to make sure he died. The cyanide pill was expired and made him sick, but failed to kill him and the River Miljacka was only 10 centimetres (4 in) deep. A few seconds later he was hauled out and detained by police. Franz Ferdinand later decided to go to the hospital and visit the victims of Čabrinović's failed bombing attempt. 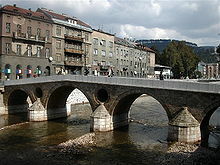 In order to avoid the city centre, General Oskar Potiorek decided that the royal car should travel straight along the Appel Quay to the Sarajevo Hospital. However, Potiorek forgot to inform the driver, Leopold Loyka, about this decision. On the way to the hospital, Loyka took a right turn into Franz Josef Street. Princip was standing near Moritz Schiller's cafe, having apparently given up, when he spotted Franz Ferdinand's car as it drove past, having taken the wrong turn. After realizing the mistake, the driver put his foot on the brake, and began to back up. In doing so the engine of the car stalled and the gears locked, giving Princip his opportunity. Princip stepped forward, drew his FN Model 1910 pistol, pistol-whipped a nearby pedestrian, and at a distance of about five feet, fired twice into the car. Franz Ferdinand was hit in the neck and Sophie (who instinctively covered Franz's body with her own after the first shot) in the abdomen, and they both died before 11 a.m.
Princip attempted suicide, first with the use of his pistol after the assassination, then by ingesting cyanide, but he vomited the past-date poison (as did Čabrinović, leading the police to believe the group had been deceived and bought a much weaker poison). The pistol was wrestled from his hand before he had a chance to fire another shot. 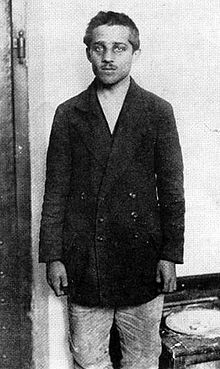 Princip was too young to receive the death penalty, being twenty-seven days short of his twentieth birthday at the time of the assassination. Instead, he received the maximum sentence of twenty years in prison. He was held in harsh conditions which were worsened by the war. He contracted tuberculosis, and had one of his arms amputated in prison when the disease infected an arm bone. He died on 28 April 1918 at Terezx�n (a place which, under the Nazi regime, in the 1940s, would become infamous as Theresienstadt concentration camp), 3 years and 10 months after he assassinated the Archduke and Duchess. At the time of his death, Princip weighed around 40 kilograms (88 lb), weakened by malnutrition, blood loss from his amputated arm, and disease. The house where Gavrilo Princip lived in Sarajevo was destroyed during World War I. After the war, it became a museum in the Kingdom of Yugoslavia. Yugoslavia was conquered by Germany in 1941 and Sarajevo became part of fascist Croatia. The Croatian Usta�e destroyed the house again. After the establishment of communist Yugoslavia in 1944, the house of Gavrilo Princip became a museum again and there was another museum dedicated to him within the city of Sarajevo. During the Yugoslav Wars of the 1990s, the house of Gavrilo Princip was destroyed a third time by the government; no attempts to rebuild it have yet been announced. The Gavrilo Princip museum has been turned into a museum dedicated to Archduke Ferdinand and the Habsburg monarchy. Prior to the 1990s the site on the pavement on which Princip stood to fire the fatal shots was marked by embossed footprints. These were removed as a consequence of the 1992-1995 war in Bosnia and the perception of Princip as having been a Serb nationalist. Later, a simple wooden memorial was placed near the site of the assassination with the words "May Peace Prevail on Earth" in Bosnian, Serbian and English. There is a plaque in front of the museum at the spot where Gavrilo Princip stood when he fired the shots. Princip's pistol was confiscated by the authorities, and eventually given to Anton Puntigam, a Jesuit priest who was a close friend of the Archduke, and who had given the Archduke and his wife their last rites. The pistol remained in the possession of a community of Jesuits in Styria, southern Austria, until it was donated to the Heeresgeschichtliches Museum in Vienna in 2004. Wolfson, Robert; Laver, John (2001-12-30). Years of Change, European History 1890-1990 (3 ed.). Hodder Murray. p. 117. ISBN 0340775262.